Hi Hi Hi!! Can you believe it’s almost Thanksgiving!? I know I’ve said this 400 times, but how the hell does time go by so fast?! Every single day I feel like there’s not enough time in the day. And then it’s Thanksgiving, then Christmas, and then it’s 2018 and I need to figure out my stupid taxes. I swear I just did taxes 4 days ago. And now it’s time again. I miss the days when I was 16 and just worked at the YMCA and taxes were quite simple. Those were the good ole’ days. Just kidding. Those were the worst. So the other night, I was lucky enough to check out the new Whole Foods in Union Station and it was so damn rad! I think it’s the coolest Whole Foods I’ve been in so far. They had A LOT of food I can’t eat like a mac & cheese bar, fried chicken sandwich restaurant, and flour-filled desserts bigger than my face, but it was still filled with over 2100 local brands, which was pretty rad. Too bad Whole Foods won’t get on the everythingglutenfree train, because that would be AWESOME!! Maybe someday! Probably not. Let’s be real. 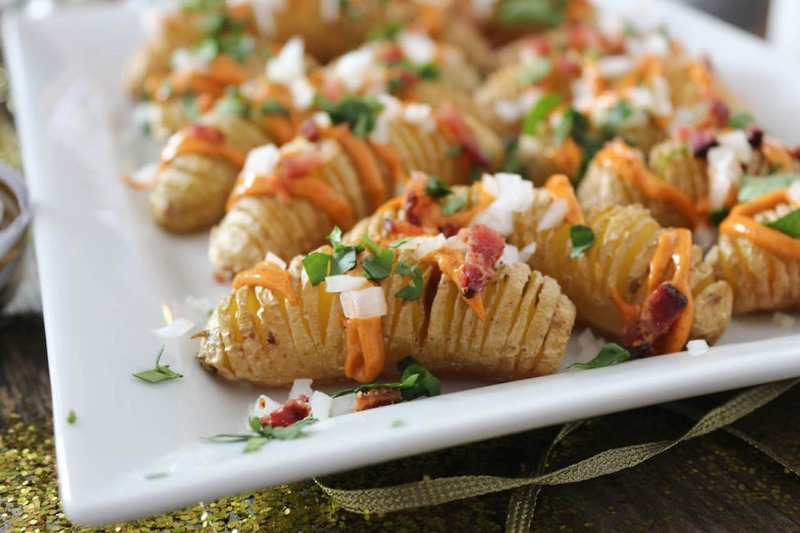 Do you have your Thanksgiving menu planned yet? I have A TON of Thanksgiving recipes on my blog since I’ve been cooking for you guys since 2011. You can see a ton of those Thanksgiving recipes here, but I’ll also be doing a round-up next week along with one last Thanksgiving recipe! I think we will just be going to our friends house Thanksgiving day so I think I may just sip mimosas that day. Every year, our gym has a Thanksgiving morning workout and mimosa brunch after. If you haven’t worked out then sipped mimosas, I highly recommend it. It’s a good time. And it’s the one time a year I’m excited to drink! Why is champagne just the best?! Speaking of champagne…did you see my Facebook live last night?! Well, it wasn’t my Facebook live whatsoever because I never do those. But my girlfriend Lyndsay who own Glamour Bar here in Denver had me on her Beauty & Bubbles Facebook Live last night where we sipped champagne, chatted paleo and holidays, then got distracted by true crime podcast chats. She’s the best! And I love that salon so much! Definitely check out the FB live! BUT WAIT, before you go, did you snag a pair of my PaleOMG x Four Athletics, Floral Print, High Waist, 7/8 leggings yet?! Only 7 more days to get your hands on them and then THEY WILL BE GONE! This is the only time you will be able to get this pattern and then they disappear! And these will ship in time for the holidays so grab your order today! And use code PALEOMG to get 10% off your order! In a medium saute pan over medium heat, add bacon and cook until crispy. Remove and set aside on a paper towel, leaving behind the bacon fat in the pan. To the hot pan, add the fat (butter, ghee or coconut oil), maple syrup, rosemary, thyme, cayenne and a small pinch of salt. Remove from heat and let the flavors meld. 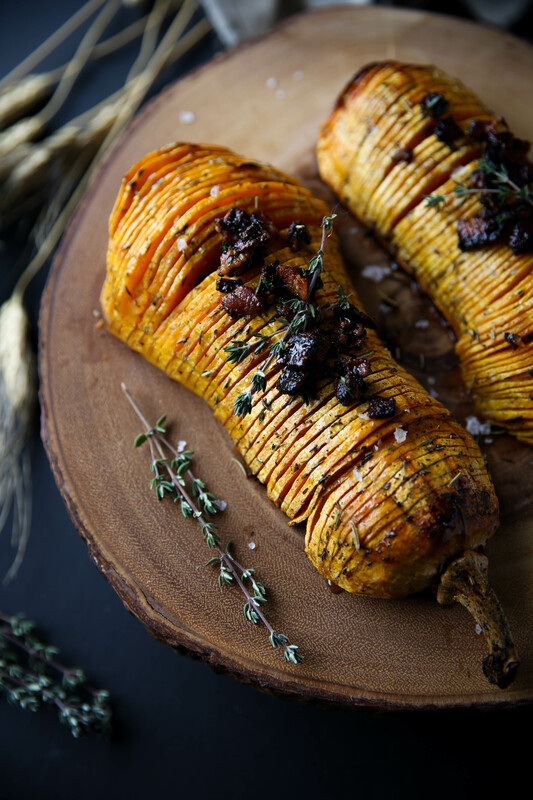 While the bacon is cooking, cut the butternut squash in half, remove the seeds with a spoon, then use a peeler to peel the skin off the butternut squash. Now, for the time consuming part. Place the butternut squash cut side down on a cutting board then place each butternut squash between two chop sticks then slice thin, even slices throughout each butternut squash. The closer each slice, the better. These chop sticks will keep you from slicing through the butternut squash. Then place butter squash on baking sheet and use a basting brush to brush all the butternut squash with 1/2 the bacon fat mixture (leaving behind the bacon), getting into all the crevices. 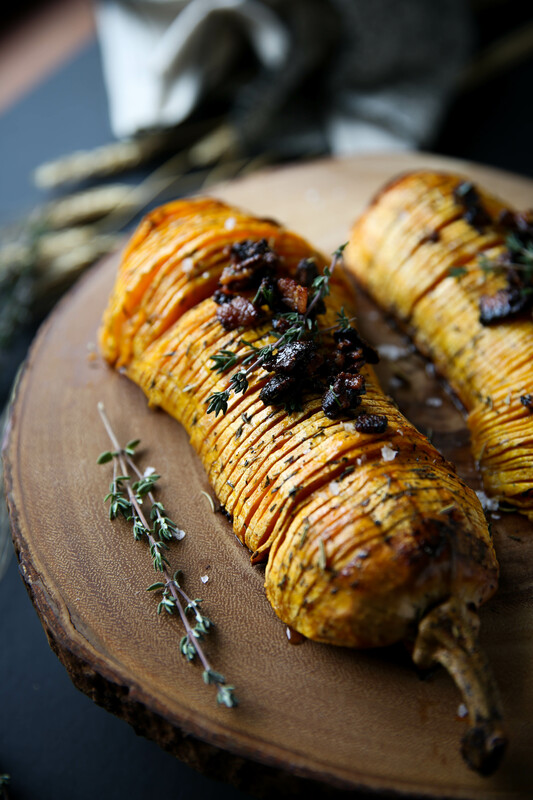 Place butternut squash into the oven to bake for 30 minutes, then brush the butternut squash again with the fat and bake for another 10 minutes. 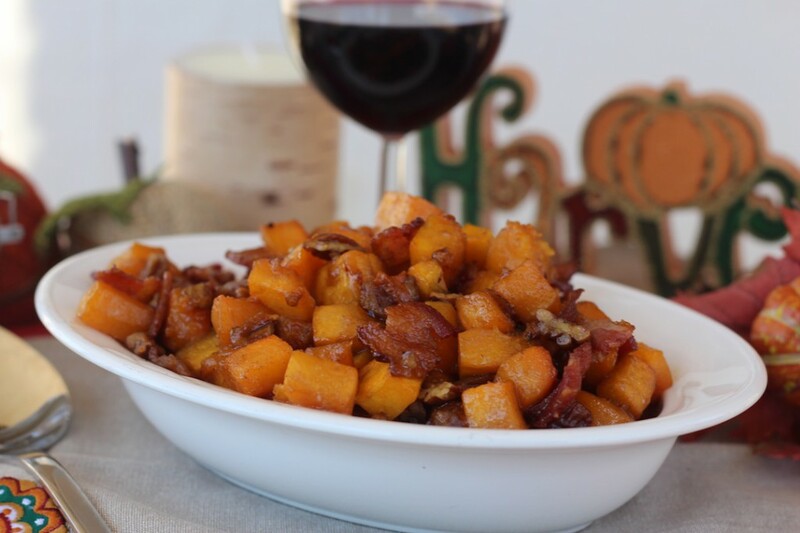 Then top the butternut squash with the last of the bacon fat and bacon on top and bake for another 10 minutes, until the butternut squash is often and tender in the middle. ” Now, for the time consuming part. Place the butternut squash cut side down on a cutting board then place each butternut squash between two chop sticks then slice thin, even slices throughout each butternut squash. The closer each slice, the better. These chop sticks will keep you from slicing through the butternut squash.” Can you please let me know in more detail where these chopsticks go? Do you want to leave slices somewhat attached so that they stay together and fan out like the picture? Hi Janna – I was confused at first too! Juli mentioned that it is to prevent slicing all the way through the butternut squash, so I think the chopsticks line up perpendicular to the way you are slicing. Think of this 0 as a squash, and you would place the chopsticks like this: |0| Then slice across the squash as Juli shows above. Your knife will stop when it hits the chopsticks, so no chopping through the squash. Hope this helps! Totally makes sense to me now, lol! Thank you for the visual!! I’m pretty sure she means next to the squash, one on each side. Your knife will hit the chopsticks before cutting all the way through the squash. You want one on each side to ensure the depth of the cut is the same. so the butternut squash is on the cutting board, one chopstick goes on one side and the other chopstick goes on the other side, both perpendicular to the butternut squash (so the butternut squash is between the two chopsticks). does that make sense? This looks incredibly delectable. I would love to make it for the big turkey fest, but I try to do mostly make-ahead because I host. Do you think this could be prepped ahead? 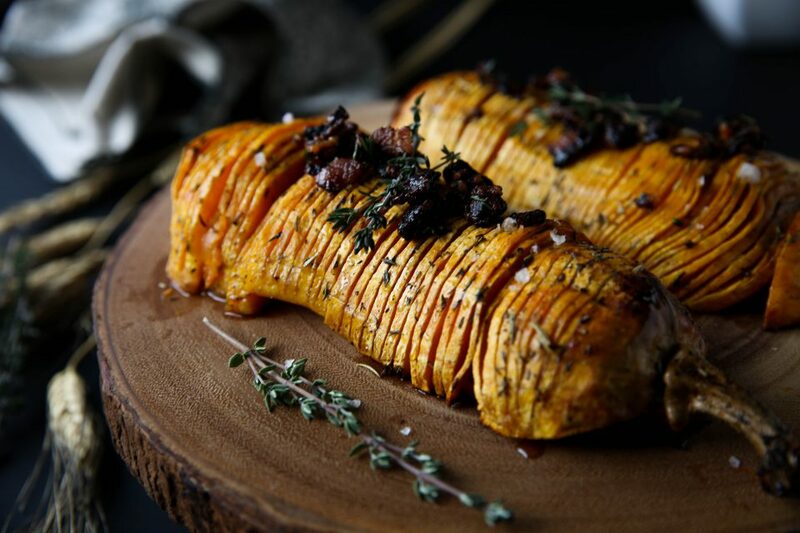 I know squash oozes a sticky liquid which would make the slices stick together, but maybe if you slice and then baste with that bacony goodness, it could keep a day like that? i honestly have no clue, i haven’t tried it that way so you may need to be the test dummy! Trying to understand…when do you add the maple syrup, butter, rosemary, etc? Thanks! updated the recipe! my browser crashed this morning while i was typing up the recipe so when i re-wrote it, it was completely forgotten about. all updated! I think you’re missing a step here? Do you combine the bacon fat with the other fats, syrup and thyme at some point to be a basting liquid at each of the 3 basting stages? omg i’m SO sorry. my browser crashed this morning while i was typing up the recipe so when i re-wrote it, it was completely forgotten about. all updated! That’s interesting I just saw pretty much this exact recipe posted in a video by Bon Appetit Magazine. It’s extremely rude to go onto her blog and insinuate that her recipes aren’t authentic. Either make the FREE recipe and leave your feedback or go to another site and spread your negativity there. Totally agree with you Christie. Plus lets be real here, it’s a butternut squash recipe during the holidays, of course there are going to be similarities. We come here for the recipes, yes, but more so for Juli’s sense of humor, personality, fashion sense, photos of Jackson….. should I keep going? Thanks for all you do Juli!!! The seasonings are COMPLETELY different. Did you actually read either recipe, Morgan, or are you just trying to be difficult? Wow! This looks amazing! Thanks Juli for another winner! 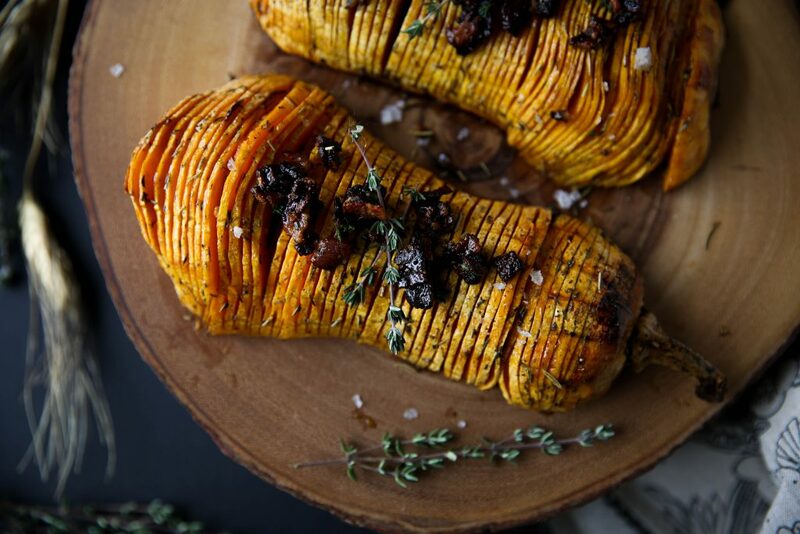 I recently tested a hasselback butternut from thefeedfeed.com. I will make it again but I definitely want to use bacon fat then. The one thing I will carry over from 1st test is to roast for 20 minutes and then slice. I’ve cut many raw butternuts and this makes that task easier. Thank you Juli for all your food inspiration and d**n funny comments about life. I made this recipe this past Saturday for a friendsgiving I hosted and it was a hit! It was pretty easy to make overall, the “hardest” part was taking the time to slice the squash, but difficulty wise this is pretty easy which I loved. And the end result is so pretty and quite fancy looking so it definitely impresses everyone when they see the dish. totally! it’s super easy, it’s just time consuming and slightly annoying haha! so glad you all liked it, though!! some things are worth the work! Thanks for the clarification! We’ll be making it ahead also, so will let you know how it goes.